“Together we created a ritual act of remembrance so that our grief could be transformed into beauty.” Students did paintings based on their connection with Psalm 23, and presented the paintings and their remembered children to the congregation at a service. For the full description of the program, click here. “I would like to tell you about Sarah’s participation in the Mitzvah Project – Remember Us. “At the beginning of her Bat Mitzvah studies Sarah was given the name of a girl who perished in the holocaust before reaching the age of her Bat Mitzvah, Haja Bloch. Throughout her studies Sarah kept this child in her mind. Sarah’s Bat Mitzvah is b’shem – in the name of Haja as well as her own. When she chanted Torah today it was also in the name of Haja. “In addition Sarah read the book “Night,” by Elie Weisel, in order to learn more about the world that Haja lived and died in, and she spoke of her in her Dvar Torah today. 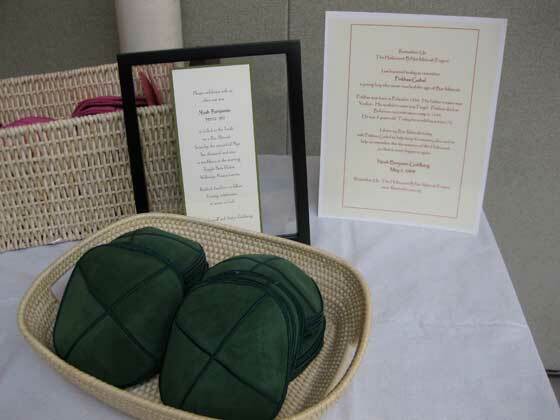 “Our tradition allows the Bat Mitzvah to take on the adult responsibility of saying Kaddish, the prayer for a family member or someone you want to remember who has died. Sarah took on the responsibility of saying Kaddish for Haja today and will do so every year on the anniversary of this date. “In addition, Sarah has pledged a donation to the congregation’s Religious School Scholarship Fund in memory of Haja, thus fulfilling the Mitzvah of Tzedakah as well. 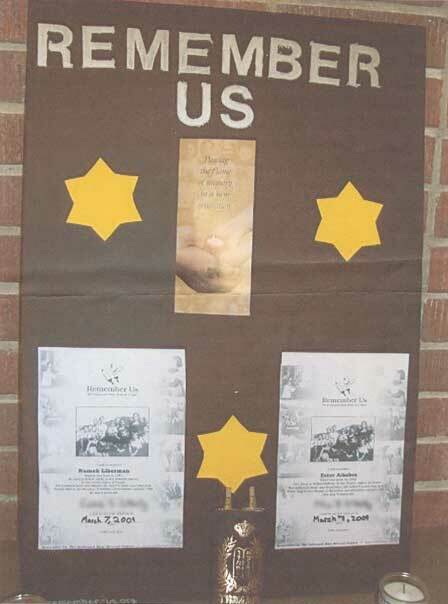 “Following our previous e-mails, we had a session with our B’nai Mitzvah families last Sunday at which participation in the Remember Us, Holocaust B’nai Mitzvah Project was discussed - and whole-heartedly agreed to. “At this time we have three boys and one girl approaching Bar-and-Bat Mitzvah. We also have one boy who celebrated his Bar Mitzvah last Chanukah and one other who recently celebrated his Bar Mitzvah - and last December traveled to Poland and to the camps with his mother. They indicated that they, too, would like to receive names as they still involve themselves with our group and also serve as youth mentors. My daughter, Eliza Greenberg, memorialized a child at her Bat Mitzvah this past May 30th 2009 at Temple Emanuel in Worcester, Massachusetts. The child’s name was Chaja Kramnik. She died in 1943 in Ponary, Poland. Through some research she did on her own, my daughter recently discovered that Chaja had a sibling who survived the Holocaust and, unbelieveably, resided in the same town as us until she died in 1994. We recently contacted the child of that sibling (who would have been Chaja's niece and, amazingly, also lives in our community!) and are making plans to meet face to face. Even before these events, the process of reading Torah for a child who had perished had been a very powerful experience for all of us (my daughter has worn her bracelet every day since her Bat Mitzvah). But now, in light of this recent discovery, the emotions run stronger and everything feels more…for lack of a better word…real. 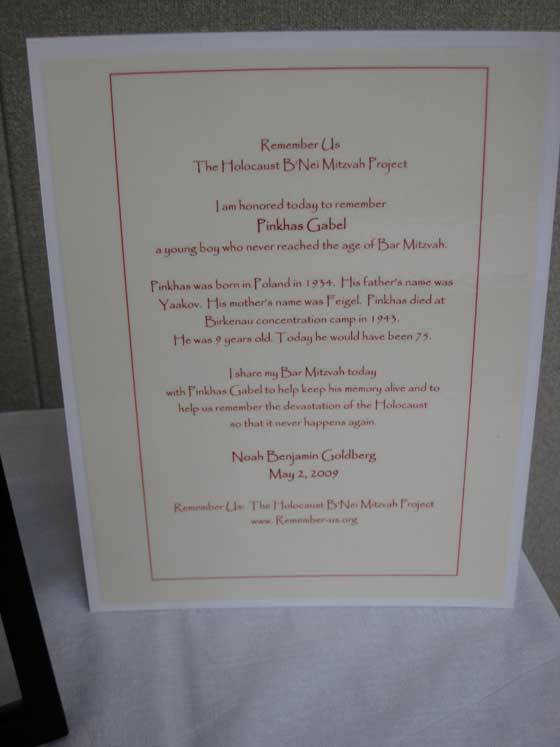 “One of the special things that I’m doing for my Bat Mitzvah is to remember a child killed in the Holocaust....As with all the children remembered by the “Remember US” project, Rochel’s name and information has been given to only one Bar or Bat Mitzvah person. I am the only one who has been given and accepted the responsibility and honor of remembering her. I have chosen today’s date, May 13, as the date on which I will say Kaddish for Rochel every year for the rest of my life. Our Jewish tradition tells us that after we die we live on in the memories of other people; as long as I remember Rochel, there will always be a part of her that the Nazis couldn’t kill. “One of the most important teachings in Judaism is to remember those who have come before us. Many of us have been named after an ancestor; it is a way to honor our ancestors and make sure they are not forgotten. My Mitzvah Project deals with this important teaching. It also deals with good and evil, and keeping hope, faith and dreams alive. “I am participating in the Remember Us: The Holocaust Bnai Mitzvah Project. I have taken on the responsibility of remembering a child of the Holocaust who died before he became a Bar Mitzvah. His name is Zoli Berkovits. He was born in the city of Oradea, in Romania. His parents were Helen and Anton Berkovits. In 1944, Zoli died at the age of five, a victim of the Holocaust. In trying to learn about Zoli and his family I have learned to understand that the Holocaust was an ugly experience for Jews and others who were persecuted by the Nazis. The good that came out of this period is that we have survived as a people and my ability as a Jew to keep alive the memory of one five–year–old boy who did not have the opportunity to take on the responsibilities of an adult in the Jewish Community. “…It is because of my parents and relatives being survivors that David and I chose to participate in the “Holocaust B’nai Mitzvah Project.” This cause really touched me.